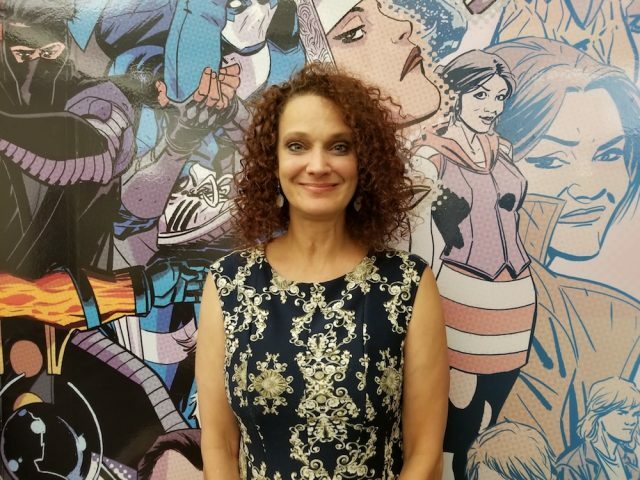 New York, NY (July 26, 2018) – Valiant Entertainment is proud to announce that veteran comics professional Lysa Hawkins has been named to the position of Editor. In her new role on the Valiant Editorial team, Hawkins will be instrumental in developing titles in the publisher’s Valiant Beyond initiative and in 2019’s slate, to be announced in the coming weeks. Hawkins has two decades’ worth of experience in the comic book industry, first in the Marvel Comics bullpen under Virginia Romita, then later as an editor working on titles like X-Men Unlimited, X-Men Hidden Years, Generation X, Mutant X, Spider-Man Unlimited, Domino, and Witches. She moved on to DC Comics, where she worked on Batman: Gotham Knights and Teen Titans Go, and was responsible for bringing in critically acclaimed writer Gail Simone to pen the Birds of Prey series. Hawkins’ hire marks the latest expansion to Valiant’s editorial team, which includes Executive Editor Joe Illidge, Editorial Director Robert Meyers, Editor Karl Bollers, and Assistant Editor David Menchel. Valiant Entertainment, a subsidiary of DMG Entertainment, is a leading character-based entertainment company that owns and controls the largest independent superhero universe in comics. With more than 80 million issues sold and a library of over 2,000 characters, including X-O Manowar, Bloodshot, Harbinger, Shadowman, Archer & Armstrong, and many more, Valiant is one of the most successful publishers in the history of the comic book medium. Valiant consistently produces some of the most critically acclaimed comics in the industry and has received numerous industry awards and accolades, including a Diamond Gem Award for Comic Book Publisher of the Year. For more information, visit Valiant on Facebook, Twitter, Tumblr, Instagram, and ValiantEntertainment.com.